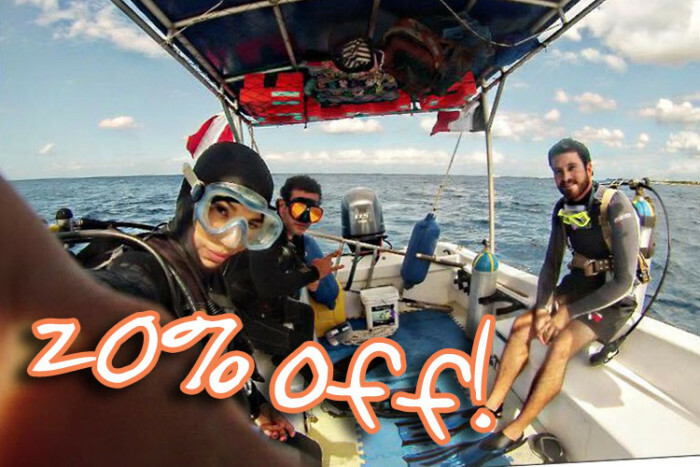 One of the best ways to enjoy Cozumel's world class snorkeling is by boat, that way you get to see beautiful reefs as well as an abundance of underwater life. A number of tours are available and this week thisiscozumel.com tried a catamaran tour that departs directly from Paradise Beach. An advantage of this tour is that you can relax on the beach for the day and go snorkeling - making the most of your vacation time. The catamaran picks up from the pier at Paradise Beach and the group receives a full briefing about the snorkel equipment, including life vests and floats. The catamaran is modern and has a stairway into the water. The more adventurous jump from the deck. Beautiful coral reef formations and underwater life can be seen once snorkeling - including rays and turtles on good days. The tour goes to Palancar and Colombia reefs, both offer excellent visibility. The ride on deck offers great views and free margaritas and sodas are available after the snorkeling. The trip lasts about 2 hours and costs $35, children under 12 go for $25 and under-3s are free. The total snorkeling time in the water is about 1 hour.